I conducted the following interview for Time Out Chicago. It should appear there at some point today. MGS: The photographs of the potatoes in your new exhibit have both a playful and mysterious quality. Some resemble science-fiction landscapes. I also remember the heart-shaped potato that you discovered in The Gleaners and I. Where does your fascination with this particular vegetable come from? AV: As you said, the discovery of heart shaped potatoes started, by chance, during the shooting of The Gleaners and I. I felt right away all the thoughts related to that modest vegetable with a shape that means affection, love, tenderness. You can’t resist the usual meaning of that word, heart, of its usual shape. Since I kept those potatoes for a long time in different places: in the dark or in the light, in open air or in boxes. I started to photograph them, to film them. When invited at the Venice Art Biennale, I did my first potato installation, Patatutopia, a triptych that has been exhibited in the Logan Center in Chicago. It’s an homage to the energy of life coming out of old potatoes, uneatable, useless, quite dead. The beauty of germs and new thin roots… It’s not science fiction, it‘s real science. Life resists, energy resists. I showed some photographs, each old potato is different from the others. MGS: The title of the exhibit is “Photographs Get Moving” and all of the early photographs on display depict some kind of movement. 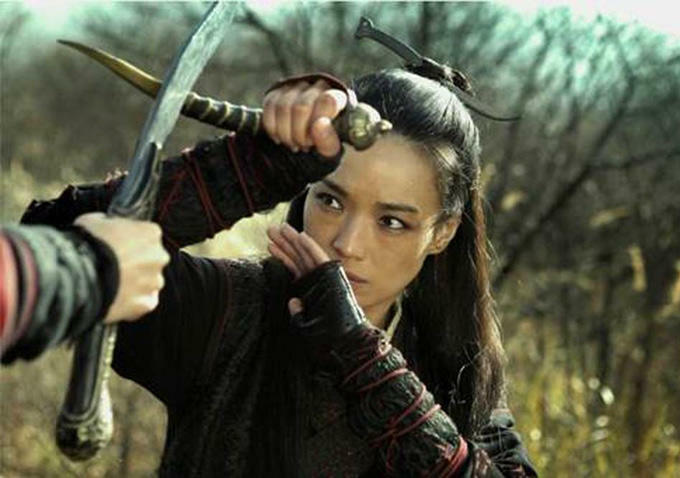 One senses the movement within these still images just like, conversely, one senses the individual still frames within your movies. What in your mind is the relationship between still photography and cinema? AV: What you saw, what you noticed is just what it is. The photographs chosen with me by Dominique Bluher, the curator, contain movement and lead naturally to the moving images, video or cinema. My work, for years, has been using the links between photography and cinema, playing to erase the borders between these two ways of showing reality, re-inventing reality. MGS: Cleo from 5 to 7 is one of the seminal films of the French New Wave and just played to a packed house in one of Chicago’s largest movie theaters. Are you surprised by its enduring popularity? MGS: For a long time now you’ve exclusively made documentary films, which I think are wonderful for the intense curiosity they show in the people who are your subjects. But my personal favorite of your works is Vagabond, which has a documentary influence but also an incomparable performance by Sandrine Bonnaire. Do you ever miss working with actors and would you ever be interested in making another fiction feature? MGS: Jean-Luc Godard has an amusing cameo in Cleo from 5 to 7. Since you and he are the only directors from that era still working today, I was wondering what you thought of his recent work. 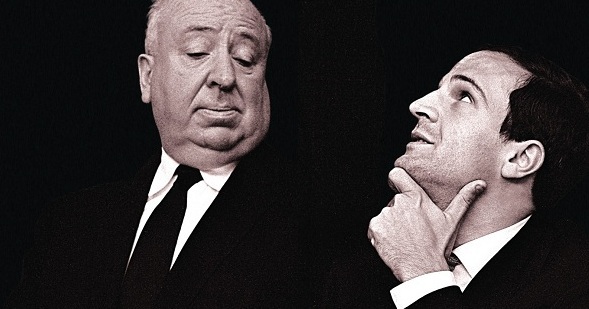 AV: Jean-Luc Godard and Anna Karina were very good friends of Jacques Demy and I in the ’60s. He came to perform with Anna a little sketch in which he accepted to take his dark glasses off for a few minutes. That’s the peak of the sketch. Jean-Luc is an experimental director and he’s certainly the one who has the most invented the language of cinema in different aspects. The way he recently used the 3D in Adieu au Langage showed how different he is from the other directors. I’m glad that he persistently films his thoughts about cinema and art. MGS: You spoke very movingly the other day about Chantal Akerman being an “uncompromising” filmmaker. I met Chantal in 1997 and she seemed pessimistic about her ability to get films financed in the future due to what she perceived as the increasingly commercial nature of the medium. Do you feel optimistic about the future of cinema and, more specifically, the possibility that daring new filmmakers will be able to create works as radical and monumental as Jeanne Dielman? 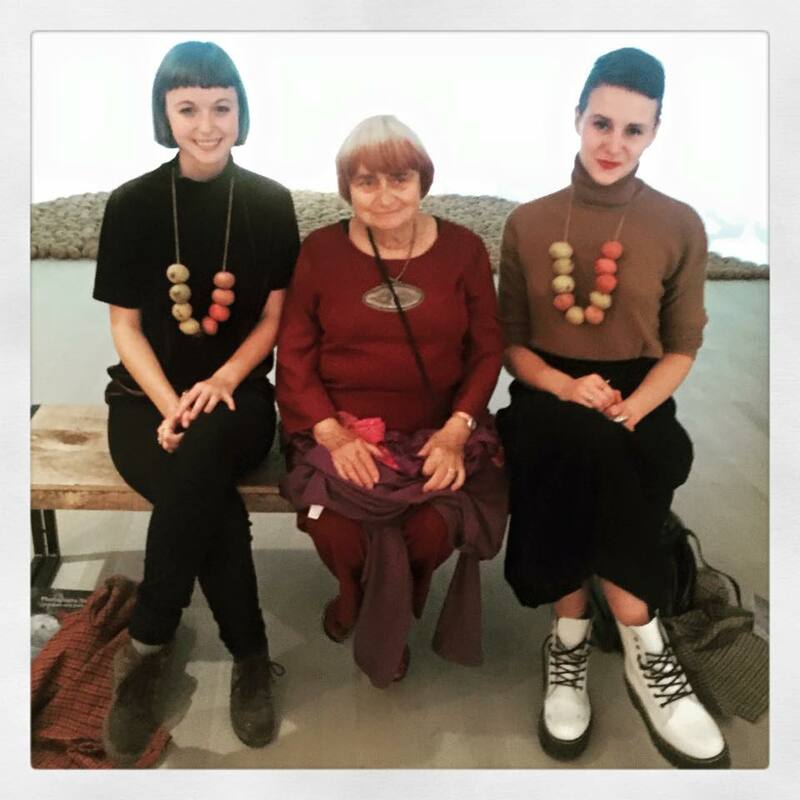 For more information about “Agnès Varda: Photographs Get Moving (potatoes and shells, too)” visit the Logan Center Gallery’s website. 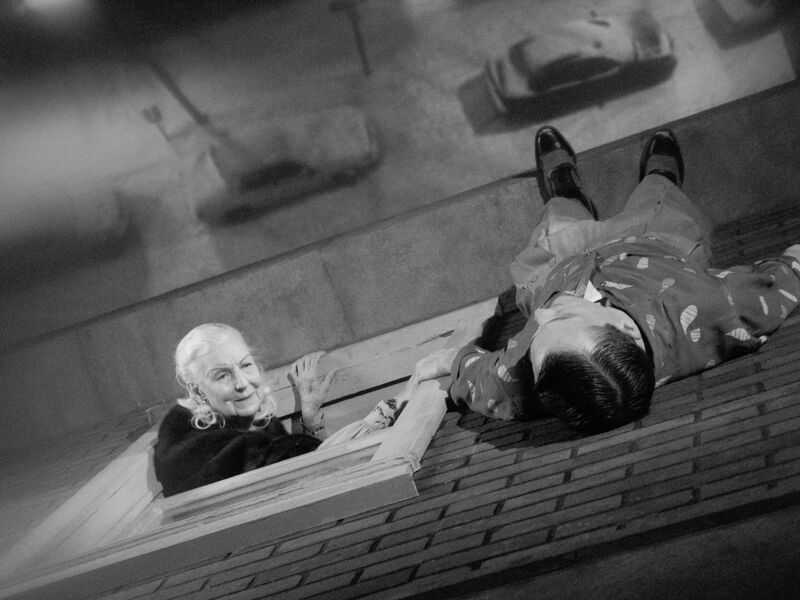 Next Wednesday, November 4, I will be moderating a discussion with a pair of architects, Design With Company co-founders and UIC professors Stewart Hicks and Allison Newmeyer, about Guy Maddin’s My Winnipeg at the Chicago Cultural Center (78 E. Washington St.). The discussion is part of a series called “Architects on Film” that the Chicago International Film Festival is presenting with special screenings of films that an architect or designer has curated. The event runs from 6:00 – 8:30 pm. My Winnipeg (Guy Maddin, 2007) — Canadian filmmaker Guy Maddin conducts a personal tour of Winnipeg, Manitoba, the town where he grew up and still lives, in a film he calls a “docu-fantasia.” By combining archival footage and interviews, dreamlike camera work, and re-created scenes—including several with actress Ann Savage (Detour) playing the part of Maddin’s mother — the filmmaker builds a portrait of Winnipeg that manages to be historical, intimate, surreal, entertaining, and entirely his own. Design With Company was co-founded by Stewart Hicks and Allison Newmeyer. Hicks is Assistant Professor of Architecture at the University of Illinois at Chicago. A Fellow of the MacDowell Colony, he is a recipient of Architectural Record’s Design Vanguard Award and the Young Architects Forum Prize. He received his M.Arch from Princeton University. Newmeyer is Visiting Assistant Professor at the University of Illinois at Chicago and also teaches architectural design and representation courses at the University of Wisconsin–Milwaukee and the Illinois Institute of Technology. She is a Fellow of the MacDowell Colony and the recipient of architectural awards from the Van Alen Institute and Architizer. For more information, visit the website of the Chicago Architecture Biennial. Hope to see you there! 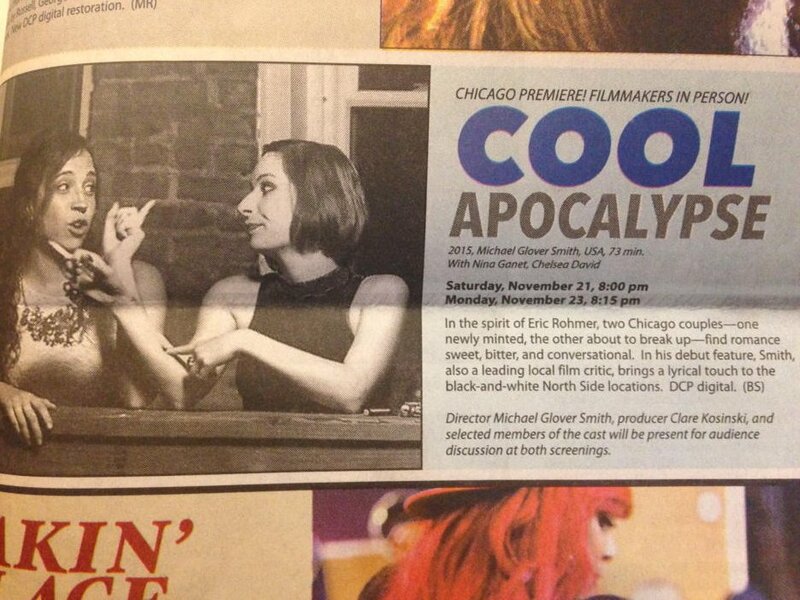 Tickets for the November screenings of my film Cool Apocalypse at the Gene Siskel Film Center are on sale now. They can be purchased in person at the box office or online at the Siskel’s website here. I will be present for Q&As following both screenings along with members of the cast and crew. Hope to see you there!